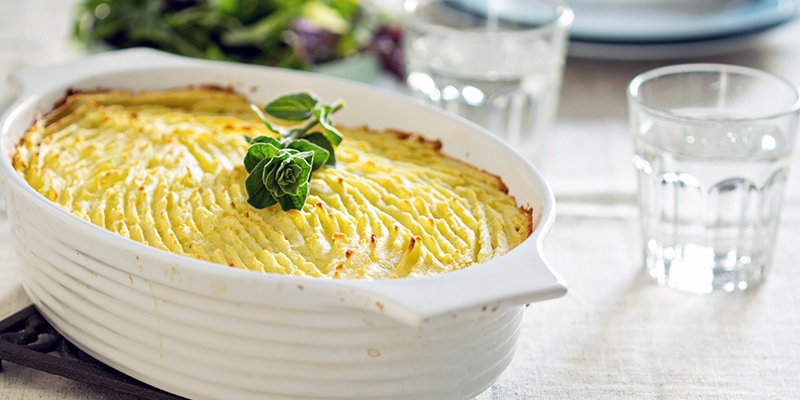 You do not have to be the world’s best chef to create this delightful dish. To add to the flavour, we’ve used some of our products to create it. We hope you have as much fun in the kitchen as we did. Heat 1 tbsp of coconut oil in a non-stick pan over a medium heat. Add onions and cook for 10 minutes until softened, then stir in the flour and cook for another 2 minutes. Add carrots, cauliflower, garlic, and rosemary, and cook for 5 minutes, stirring regularly, until they begin to soften. Cover with a lid and let them simmer for 10 minutes, then remove the lid and cook for 10 to 15 minutes more, until the sauce has thickened and the vegetables are cooked. Season and stir in the fresh peas and cook for 1 minute more. In a separate pot, boil the potatoes until tender. Drain the potatoes, and mash. While mashing, add small amounts of milk to reach a fairly soft consistency, then add butter and season. 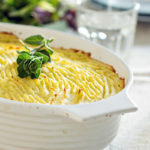 Spoon the vegetables into a pie dish, top with the mash, level with the spoon and make sure all the vegetables are covered and then drag a fork lightly over the surface. Place under the grill for a few minutes until the top is crisp golden brown.